Can I ship my gear to your store? Yes, of course you can! Send It Home is happy to receive and hold your gear. We charge between $3-$10 per box when you pick it up from us. If you need us to store it for a while, let us know and we may charge a little extra. Please Ship it via UPS or FedEx. We are not allowed to accept USPS, and DHL/Airborne does not come to West Yellowstone. We also appreciate it if you could give us a call at 406-646-7300 or email us and let us know that it's coming! Can I Ship Bear Spray? 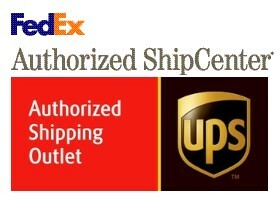 Send It Home is a UPS Authorized Shipping Outlet, and a FedEx Authorized Ship Center. Our agreements with both FedEx and UPS prohibit us from shipping any kind of Hazardous Material. Bear Spray is an aerosol, and for the purposes of our agreements, aerosols are considered Hazardous. We can't ship hair spray either. You are not allowed to fly with it. You can ship it via UPS if you take it directly to a UPS hub. Unfortunately, there isn't one here. Can I Ship Alcohol, Tobacco, or Firearms? We are prohibited from shipping any kind of firearms, alcohol and cigarettes. If we suspect that your sealed package contains any of these items we will open it to check. Can I ship on my own FedEx or UPS Account? The short answer to this one, is : Sometimes. FedEx Express - Overnight, Two or Three Day service. If you bring your own pre-printed label, or fill out a FedEx airbill with your account number. we will provide some FedEx packaging. If you need us to pack your item and then put your airbill on the box, this is fine too. You will have to pay Send It Home for the packing service or the non FedEx packaging materials. Send It Home has no liability for any packages shipped on your account, whether we pack them or not. FedEx Ground - Unless you bring your own pre-printed bar coded label we are unable to ship FedEx ground on your account. UPS Air - Send It Home stocks minimal UPS supplies. UPS does not guarantee overnight service from West Yellowstone, and From Mid-October to Mid-June all packages shipped via UPS experience a full day's delay getting to the UPS hub in Bozeman, and therefore a delay in your delivery. Two day packages will arrive in three days. UPS Ground - Unless you bring your own pre printed bar coded label, we are unable to ship using your UPS Account. Do you sell boxes? Can I pack my box myself? Send It Home sells boxes in many sizes. We will gladly tape the bottom of the box for you, so you can take it back to your hotel, trailer or home and fill it up. We ask that you please bring it back open, so we can make sure it's all packed safely. If you bring us a sealed box, we may open it to check for safety. If you are shipping items valued at greater than $500, our insurance company requires that we inspect your shipment for proper packaging. Feel free to give us a call at 406-646-7300 if you need advice on how to package things. If you have fragile, and/or high value items, you will probably be safer to bring them to us and let the professionals handle it! Please DO NOT wrap your boxes in brown paper! This is an easy way for your package to get lost should the paper tear and the label disappear. The carriers and Send It Home will not honor any claims on packages wrapped in brown paper. Does someone have to be there to sign for it? The answer to this one is ultimately up to the discretion of the driver. If you are shipping to a residential address, in most cases the driver will leave the package without a signature unless you have specifically requested that a signature is required. If you are shipping to a commercial address, the package will not be left without a signature. Our insurance company requires a signature on packages valued at more than $1000. What time are your packages picked up? FedEx Express (overnight, two or three day service) is required to pick up after 2pm daily. Overnight packages are guaranteed if brought to Send It Home by 2:00pm every day. UPS usually picks up around 4:00pm. UPS does not do overnight delivery from West Yellowstone.